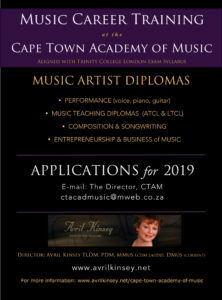 The Cape Town Academy of Music was founded by Avril Kinsey in January 2000. A boutique academy with studios in Tokai and Glencairn. Music education for students of all ages and levels with one on one private music lessons on weekdays in voice, piano, guitar, violin, electronic keyboard, theory of music, songwriting and composition. Tertiary levels for one or two years of study of internationally accredited diploma courses such as ATCL and LTCL. Training students for a career in music or providing a means to university level studies. After a consultation with Avril your child may embark on music studies for the duration of their school years. Trinity College London accredited exam options in classical and rock and pop genres. Performance practice where students build confidence and grow in the art of playing in front of an audience. Our Academy also specialises in offering a unique certified Music Artist Diploma Course, which includes a practical instrument or instruments with several theoretical subjects. The courses are for one year and the student can commence in January or July. Suitable for those wanting to focus on PERFORMING and/or COMPOSING, TEACHING MUSIC or MUSIC PRODUCTION. Classes and lectures which are held under the auspices of the Non Profit Organisation (FCTAM) and take place specifically at the Teaching Studios Tokai Community Church, in Tokai. DOWNLOAD the Pdf. file for more information CTAM PROSPECTUS Request our application form for either part-time lessons or the full-time certificate courses by completing the form below. Here are some of the reasons why learning music is so important. Carolyn Phillips (Director Norwalk Symphony Orchestra, USA) is the author of the Twelve Benefits of Music Education. Her information above also refers to an article by Dave Gerhart on percussioneducation.com. (The above was accessed from a CPO newsletter).